Here is Roller Cone Bit Supplier talking about Carbide drill bit processing deep hole precautions. If you have any idea about Tricone Bits Factory, welcome to contact us and discuss. More and more processing plants are replacing deep holes with gun drills with solid carbide drills. Some solid carbide drill bit manufacturers believe that the performance advantages of such drills are increasing for manufacturers who use deep gun-holes on their own lathes or subcontract deep hole machining tasks to gun drill shops. Great attraction. However, solid carbide deep hole drills have some limitations compared to gun drills, which typically use hard alloy or hardened high-speed steel drill tips, hardened steel shanks, and straight grooves. For example, their drilling depth limit (dimension) is 40 times the hole diameter, and the gun drill can easily drill deep holes with a depth of 50 times or more. 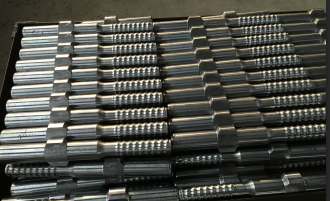 The processing product Roller Cone Bit Wholesaler which manufactures both gun drills and solid carbide drills points out that gun drills can drill a variety of difficult-to-machine materials. “Because the gun drills are slower, the chip discharge is slower. When drilling titanium and stainless steel, chip removal is a big problem, and gun drills have better versatility when machining difficult materials. In these processes, gun drills are still used in large quantities." Another obstacle to the use of cemented carbide deep hole drills is that workers are concerned about the potential hazards of brittleness and the resulting fracture. For example, a manufacturer is worried about whether a solid carbide drill with a diameter of 6.35mm can be drilled on a very difficult-to-machine alloy such as Nitronic50 nitrogen-reinforced austenitic stainless steel in less than 4 minutes. The 240mm deep hole, while the drill bit can still remain intact (as one Jinfeng alloy tool salesman claims). The person in charge of the factory first clamped a standard length carbide drill to the lathe, drilled a guide hole with a hole depth of 2 times (about 13mm), and then used the RT100T internal cooling. The alloy drill (diameter 6.35 mm, length 30 times diameter) is drilled. He said, "I switched to an M00 code. Then I used a high-pressure nozzle of the lathe cooling system to provide 2000psi, 3.5gpm high-pressure coolant. Because of the high-pressure cooling, the sealed collet chuck was chosen. To clamp the drill bit. When the drill bit is drilled into the hole, the high-pressure cooling nozzle is turned on. The cutting parameters are circumferential cutting speed 42m/min (140sfm), spindle speed 2140r/min, feed rate 0.089mm/r. The machining time for drilling each hole (including the drill guide hole) is approximately 3.5 minutes. A total of 65 holes were machined before the bit had to be reground and recoated (TiAlN coating). From a productivity point of view, the machining efficiency of the solid carbide drill bit is 8 times higher than that of the gun drill; from the perspective of processing cost, the shop saves the labor cost and transportation cost of the external processing. Although the price of a solid carbide drill ($375) is more than five times higher than a gun drill ($70), a significant increase in productivity can quickly offset and exceed tool costs.